When it comes to choosing a type of roof, you have many options. Your first decision should be to call Up and Above Contractors, a local, professional New Jersey roofer who uses the highest quality materials. Up and Above is certified to install GAF roofing products, the best in the industry. Being a Master Elite contractor means that GAF gives you its assurance that you are dealing with a reputable, licensed, and properly trained contractor. 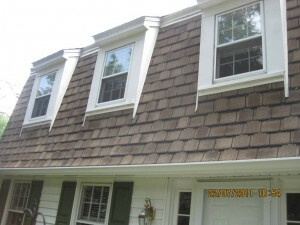 To learn more about GAF products and their shingles visit here. Shingles are the most popular choice for roof coverings because of their low installation and maintenance costs. Shingles come in different grades. The better the grade, the longer the life expectancy, which can range from 15 to more than 30 years. The asphalt covering is actually a composite made up of either a fiberglass or rag mat with asphalt, which is covered with colored mineral granules. Multi-layered shingles give this otherwise thin material improved dimension making it resemble other, thicker materials. Asphalt shingles also come in a variety of colors and styles. Individual shingles may be replaced if damaged. Another advantage of asphalt shingles is that in certain circumstances, they can be installed over an existing layer of asphalt shingles, eliminating the need to remove the old roof. 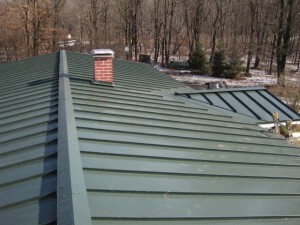 Durable and flexible in terms of looks, metal is becoming a more popular choice for New Jersey homeowners who want a roof with a longer life span and little to no maintenance. Metal comes in a wide range of shapes, styles and colors. It can even imitate the look of tile, asphalt or slate. Metal roofs often last for 40 years or more and most come with a lifetime warranty. Up and Above Contractors has been installing metal roofs all over Morris, Sussex and Warren Counties — ask to see our portfolio. Slate is extremely durable and graceful, coming in a variety of looks, while offering low maintenance costs. Typical colors are grey, black and red. Like tile, slate carries the onus of extra weight and this high-quality roofing material tends to be more expensive. 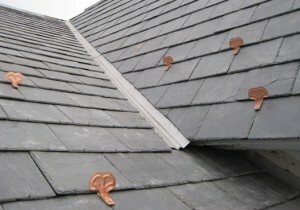 However, a slate roof can last over 100 years with little or no maintenance. It’s easy to fall in love with a slate roof installed by Up and Above Contractors.